Border management is complex and multifaceted as it involves multiple government departments, including national and provincial authorities responsible for agriculture, health, revenue and tax, state security and transport services. Integrated Border Management (IBM), a concept first used by the European Union in the early 2000s, calls on the collaboration between these various key government departments to improve border management. IBM states that individual border authorities are generally more effective when cooperation is in place. This translates to cooperation between the various departments involved in border management in the same country as well as cooperation with the border authorities of neighbouring countries. While some countries have merged border agencies and others have set up formal structures for cooperation, the aim of these integrated border management systems tend to be the same: facilitating legitimate travel and commerce while preventing illegal cross-border activities. With the growing threat of terrorism, syndicated crime, poaching and smuggling, and the unlawful movement of people, drugs and contraband, protecting national borders is a priority. 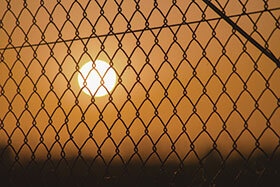 One of the key components of border management is physical border security. With proven experience of border protection solutions around the world, Betafence has established specialised physical security solutions that have been specifically configured for border security. The physical perimeter of a border comprises the actual demarcation of the international boundary and provides a physical barrier against illegal crossing. Depending on the risk factors of each individual border area, fencing solutions can provide hardened protection against cut and climb attempts, hostile and unauthorised vehicles, and even ballistic and rocket-propelled grenade attacks. A critical feature required from border fencing is good visibility that enables border protection officers to perform surveillance. Fence visibility is also important for camera surveillance. When integrated into a total solution, long range radar, CCTV and security lighting offer reliable detection and surveillance, which aids border officers in accurately assessing situations and responding effectively to potential threats. A vital security system that will ensure that teams are deployed in time, is Perimeter Intrusion Detection Systems (PIDS). PIDS augments the physical perimeter to provide early warnings of breach attempts (climbing, cutting and bending of fence fabric) and triggers alarms, cameras and lighting for effective detection and inspection. For the control and management of lawful border crossings, border authorities use access control systems at authorised border checkpoints. The physical barriers and structures employed at border checkpoints include vehicle wedges, bollards, tyre killers, turnstiles, gates and guard houses. The design of a checkpoint must include access control in such a way that: border officers are protected and supported in performing their duties; vehicle traffic and speeds are managed; unauthorised entry is prevented. Where hostile vehicles pose a threat to security, crash-rated barriers can provide mitigation. Wherever crash-rated solutions are used, border authorities need to verify that the systems have been tested and certified according to relevant standards. The final component in the deployment of a physical security solution is the integration of all of these systems into one solution. This ultimately enables border authorities to assess the intelligence gathered from the different components to effectively respond and report any and every security event. The purpose of an effective border security solution is not only to prevent illegal cross-border activities, but also to empower border authorities with the ability to detect and react to breach attempts and facilitate legal crossing at designated checkpoints. As miscreants become more sophisticated, security systems must be a step ahead to anticipate, detect and mitigate against threats to protect our citizens, infrastructure and economy. This article was supplied by Betafence.